You are here: Home / Galaxy Note 4 How-To Guides / How to use Galaxy Note 4 finger scanner? What can I do with Galaxy Note 4 finger scanner? Samsung introduced fingerprint scanner in Galaxy S5. So, Galaxy Note 4 finger scanner is actually the second iteration of this feature. 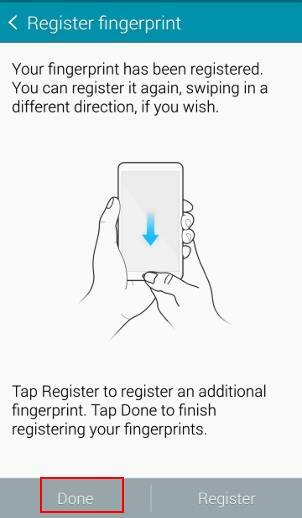 Apparently, Samsung did not highlight the Galaxy Note 4 finger scanner partially due to poor reception of this feature in Galaxy S5. In Galaxy Note 4, Samsung polished the finger scanner without dramatic change. Now, it works far better than that in Galaxy S5. But it is still not up to par compared to fApple’s Touch ID. To use Galaxy Note 4 finger scanner, you must register your fingerprints on the phone. The fingerprint info is save only on the phone, according to Samsung. 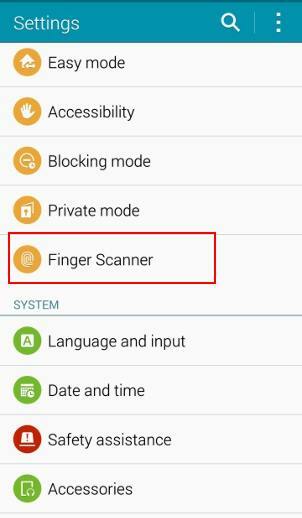 You can go to Settings–Finger Scanner to access the Galaxy Note 4 finger scanner settings. Tap Fingerprint manager as shown below. The system will tell you that your fingerprint info will be saved in the device, not on any Samsung servers. This is to address the privacy concerns of some Galaxy Note 4 owners. You then can register your first fingerprint. You need swipe through the home button downwards. Of course, after you register 10 downward swipes, you can register upward direction swipes. You cannot swipe through home button horizontally because of the two hardware buttons in each side of the home button. Once finishing one fingerprint, you can tap Done to save the fingerprint info into the phone. When you try to save your first fingerprint info, you will be asked to set up a backup password for Galaxy Note 4 finger scanner (alternative password). This backup password can be used when your fingerprint is not recognized, for example, when your hands are wet. In other words, whenever fingerprints are accepted, this backup password can be used as well. This password is saved locally on the phone. You can only change or reset this password with your fingerprints or this password itself. Google account and Samsung account can NOT change or reset the backup password unless you reset the phone. So it is important to write down this backup password, and save it in a safe place. 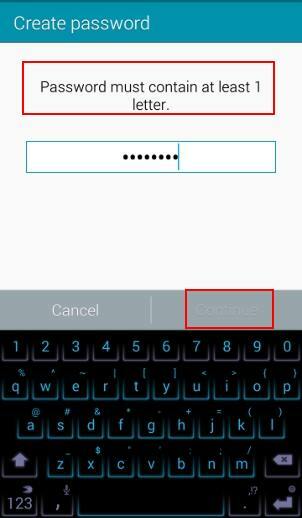 The security requirement for the backup password of Galaxy Note 4 finger scanner is 6 characters long with at least one number and one letter. If the backup password does not meet the requirements, you simply have to provide it again before you can confirm the password as shown below. 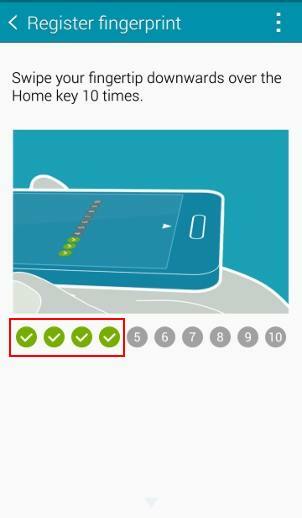 How to manager fingerprints in Galaxy Note 4 finger scanner? You can manage your fingerprints (e.g., register more fingers, delete fingerprints) in Settings–Finger scanner–Fingerprint manager. To access fingerprint manager, you need authenticate yourself with your registered fingers, or with the backup password. You can tap the keyboard icon to type the backup password if none of your fingerprints is recognized. Once you enter fingerprint manager, you can tap the+ button to register more fingers. Galaxy Note 4 allows you to register up to 3 different fingers. But actually you can use different fingers for each registration, i.e., you can use different fingers for the 10 strokes. So, it is easy to register your 5 fingers without losing accuracy. To manage the saved fingerprints, you can tap and hold the name of the fingerprint as shown below. This will make it selected. Once the fingerprint is selected, you can tap the pencil icon to edit, or the dustbin icon to delete it. Both icons are in the top right of the window. Another way to manage fingerprints is to tap the menu key (3 vertical dots) as shown below. Now you can select one of the registered fingerprints. Once the fingerprint is selected, you get the similar icons of editing and deletion as shown above. Why my fingerprints are not recognized in Galaxy Note 4? Sometimes, it is frustrating when your fingerprints are not recognized. your finger is too wet. Dry it. you do not wipe through the home button. You need wipe though the home button. This can be tricky if you are using OtterBox like cases. the part of finger tips is not registered. When registering your fingerprints 10 times, you need try different parts , especially for big fingers. internal software hiccup. You may reboot the phone to try again. How to unlock my Galaxy Note 4 if my fingerprints are not recognized? Use the alternative password (backup password). On the lock screen, you can tap the keyboard icon to type the backup password to unlock the screen. Use Android device manager to unlock the phone with your Google account. Please note, your Google account can only unlock the phone. 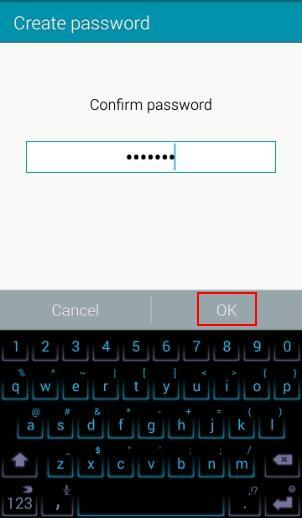 It cannot reset the backup password for Galaxy Note 4 finger scanner. If I forget the backup password for Galaxy Note 4 finger scanner, how to reset it? If you forget the backup password (alternative password) for finger scanner, you can reset it with one of the following 3 methods. Use your fingerprints. If your fingerprints are recognized, you can go to Settings–Finger scanner – change backup password to reset the backup password by authenticating yourself with your fingerprints. De-register all fingerprints. Of course, this also requires that your fingerprints are recognized. In fingerprint manager, you can delete all fingerprints. Once all fingerprints are de-registered, the Galaxy Note 4 finger scanner is reset. You can register your fingerprints again and setup a new backup password. Factory data reset. If you forget the backup password and none of your fingerprints are recognized by the Galaxy Note 4 finger scanner, you probably have to reset the phone. This essentially erase all your data and settings on Galaxy Note 4. So, you should always backup your data before resetting. Can you use Galaxy Note 4 finger scanner now? If you have any problems or questions to use Galaxy Note 4 finger scanner, to manage fingerprints, or to manage the backup password for finger scanner, please post them in the comment box below. 1. When I click on the keyboard icon to put in my password nothing happens. My phone restarted and now I can’t get into my phone because you have to use the backup password and I can’t get the keyboard to appear. 2. The fingerprint scanner doesn’t work consistently and I want to go back to not using it but I can’t figure out how to cancel it. 1. Did you disable Samsung keyboard? When you set up fingerprint, you were asked to set up password/pin. You can only use PIN or password to unlock the phone after a reboot. Fingerprint is only a secondary method since Marshmallow because the fingerprint data must be protected by PIN/password. 2. You can delete all registered fingerprints, or choose not to use fingerprint to unlock phone in fingerprint manager. You should check with the seller. It sounds like a hardware problem. Thank you so much for your post! I’ve been locked out of my phone for the past six days because when I was in power saving mode, the fingerprint option somehow disappeared and my Wi-Fi and I were both off. Because of this, I was unable to sign in via my Google account. I kept entering what I believed was my backup password and all different combinations of other passwords I use for my laptop and email etc. It wasn’t until I read your post about “the security requirement for the backup password of Galaxy Note 4 finger scanner is 6 characters long with at least one number and one letter” that a lightbulb went off. My password was correct, however I had omitted the one digit I placed in there. I’ve been so stressed out for the past week and this is a huge relief. I really feel for anyone who’s going to this because everywhere I turned, I was only given the grim choice of having to wipe my phone which was never an option. I hope this helps someone else. Good luck to all ! Is your Note 4 running on Lollipop out Marshmallow? If in Marshmallow, it doesn’t use backup password. You need set screen lock as pattern/PIN/password to use fingerprint. i can connect to my phone with android device manager and can set password and it lock my phone but the fingerprint backup password is deffrent with that password myby ???? are there 2 kind password one backup password and one pattern(that can change it with android device manager) ?? but how we can change the finger print backup password that want in start window???? Android device manager can only lock the phone. It can NOT unlock the phone or change lock screen security. Google removed this feature long time ago for legal concerns. When you set lock screen password, it should tell you the phone is already locked and the password is not used. When trying to access private mode using fingerprint it doesn’t work (had glue on my finger) and then your prompted for password. Password has been lost and it no longer gives the option for using my fingerprint. Please answer this question: IS THERE A WAY TO GET THE OPTION BACK TO SCAN FINGERPRINT? if your fingerprint can be recognized. you can change backup password in Settings– finger scanner with your fingerprint. AGAIN, it no longer gives me the option to use my fingerprint it goes right to asking for a password (even in settings). IS THERE A WAY TO GET THE OPTION BACK TO SCAN FINGERPRINT? It depends on firmware (your region). In some regions, it may switch back to fingerprints after clearing cabbage and a few reboots. But in other regions, it seems it will not revert back until it’s updated or reset. You may check with local Samsung service center to find a way out. You need backup the phone, then try a factory data reset. you probably turned on some accessibility settings. Check Settings–Accessibility. I was quite surprise it actually worked!!! Hope this helps!! Sorry, I meant to factory reset my “phone”. Please note, there are two conditions for this method to work: 1). your phone has internet connection. For Samsung phones, you can NOT enable WiFi or mobile data when it is locked. This means if both WiFi mobile data were disabled before you are locked out, this method will not work. ; and 2). you added a Samsung account on the phone before you are locked out. as of a little while ago my phone wont recognize my fingerprint and its saying the backup password is incorrect. i have no way of unlocking my device while its doing this, how can i fix it? Thanks but i don’t have samsung account on my phone, and did not received any offer to unlock by Google account, is there any other option? Then, probably no. You probably have to reset the phone. If you fail a few times with the backup password, does it offer you the option to user your Google account to unlock the phone? Unlikely. You probably entered the wrong password. Anyway, you can try to add a Samsung account, enable find my mobile, then reset the screen lock from Samsung find my mobile website. I have a standard white samsung galaxy note 4. I have 3 of my fingers registered to unlock my device, I however did forget my backup password. The problem I have is that no matter what I do the phone always sends me straight to the back-up password way of unlocking my phone, I have no way of using my fingerprint scanner. the fingerprint scanner option doesn’t even come up. I tried turning my phone on and off again, nothing happened. I tried letting it run out of battery and then charge it again, nothing happened. I have tried removing the battery while the phone is turned off, and then again removing the battery when it was turned on, nothing happened. After all my attempts it would always jump straight the back-up password option. I have also tried to do something using the android device manager, that also didn’t work. What do I do? You can try random password a few times. In some regions, it will then allow you to use Google account to unlock the phone or reset back to fingerprints. Android device manager note can only lock it wipe device. It cannot unlock devices due to legal reasons. You can try Samsung’s Find my mobile services to unlock the phone with your Samsung account if you added the Samsung account to the phone before. Hi, I cannot remember my back up password for the finger print scanner, the android device locator, I changed the password but this did not work. Am I screwed? Is the re-set the only way? Being trying it for a while now! So I have the Note 4, and I use the fingerprint scan for my lock screen, and it works fine. But oddly enough, sometimes when I wake the device, I see the phone, lock, and camera icons on the lock screen, and if I just swipe across the screen, the device unlocks without prompting me for a finger print. Other time, it will prompt me for my fingerprint as soon as I unlock the device. Anyone have any ideas? You can access camera from Galaxy Note 4 lock screen without unlocking the phone. This is the purpose of camera shortcut in the lock screen. But you cannot access other apps of the lock screen security is fingerprint. I get that, but it unlocks the entire phone. What I mean is I swipe across the middle of the lock screen, not any icons (camera, etc), and the phone unlocks and loads the homescreen. Basically, I am bypassing the fingerprint security by simply swiping the screen. Did you enable smart lock? I think that may have been it. It was enabled by default, so I’ve disabled it. I also set it to lock when the power button is used. Seems to have corrected the behavior. Thanks! Here is a simple question. If the finger print scans are held locally on the phone, and samsung offers no master reset option—————then why other than tracking users for the Samsung and the NSA , would you even need to register a finger print ??? Snowden warned everybody about mass spying and this is yet another way to verify that it is “you” that was using your phone. This type of information will be used against people who the government decides has committed any type of crime. So your own phone will testify against you. Big brother in the palm of your hands !!! Select another method and try again. ok so I did something bad. I put in the wrong fingerprint wrong until my phone locked and I thought it was going to just give me 30 secs and then I could try again but yah that didn’t happen and I don’t know my back up password not even my gmail that Verizon created for me. aahhh idk what to do! I really do not want to reset my phone! Help me Please!!! If nothing is setup, you can just reset. When you register your fingerprints, you are required to setup the backup password, Otherwise, the registration will not proceed at all. Go to settings, security, and clear credentials. Once complete you can go and remove or turn off you finger print scanner. Very likely, you have one or more Exchange email account, or have a VPN account. If these present, you are not allowed to use swipe. There is no official way to reset the password for private mode. You have to reset the phone: this means you will lose the folder. You may try to backup the phone with Kies on a PC to see whether you can find these files. The fingerprint function is a disaster for me. It will not recognize my one fingerprint, so I can’t get into the menu to stop fingerprint identification. I suspect women have more problems as our fingerprints are not as prominent. This feature should be removed as it is horrible and creates frustration and work. I use att note 4 but could not register my fingerprints even I tried steps again and again even I reboosted not 4 several times. I thought that could be a hardware failure and how should I deal with this problem. If you cannot register fingerprints, you probably have to visit the service center. No, even couldn’t recognize the first fingerprint. Then you probably have to visit the device center. Try to backup your data before leaving. My backup password does not work. I think my finger was just wet. I would like to go back to scanner. How can I switch back from backup password to fingerprint scanner? Also, Device Manager does not unlock the phone. It only locks it. And when I enter a new password. It informs me my phone is already locked, no need to change password. I want my scanner back. I am sure it will work. Android device manager allow you to set a new lock. To be precisely, it is a reset of the lock. so you can use new pin unlock the phone. The word in the page is a bit misleading. SIMON!!! HELP PLEASE!!! I am so desperate and frustrated! Is there any way at all to switch back to fingerprint scanner from backup password? I cannot remember my password at all.. I tried ALL combos and ALL password that I can think of and it’s not working at all!!! I am in my 70th times now! I know if it went back to my fingerprint scanner it will work. I was doing laundry last night and my thumb was cold and it didn’t recognized it and so it went to backup password. I did go to my ADM account and the password that I put in (6 numbers) is NOT working to unlock my… it is still saying Incorrect Password. Then this morning I went to AT&T and they are no help at all. They said that they cannot unlock it for me and directed me to Samsung Customer service office so I went there and the tech guy told me that since Google updated, ADM doesn’t work anymore to unlock the phones. Is that true at all??? Is that why I cannot unlock my phone using my ADM account? I hate to do a Master Reset. I have tons of entry on my calendar (which I didn’t sync) and Colornote memos (which I haven’t sync yet) and tons of recent vacation pictures on my phone. AARRGGHHH!!! I am going to cry!!! Please help!!!! Yes, Google updated the android device manager. You cannot reset the screen lock with android device manager. It can only lock the screen if it’s unlocked. HI Simon… Unfortunately, I cannot look into my Galaxy Note 4 device for this Samsung Find My Mobile Service because it is locked. (By the way, I am in my 100 times of trying a password 🙁 ).. I do have a Samsung account and I registered my Note 4… but I cannot do into my device for this to work 🙁 .. Any other suggestions please??? You can access find my mobile from any pc. Then choose unlock. Can you log in Find My Mobile from your pc with your Samsung account? There are no other ways to unlock the phone without resetting it. This is the purpose of the lock. Otherwise, anyone with the phone can easily access your personal files. If you think you can still have chance to remember the password, reboot the phone, have a cup of coffee, walk 1km, then go back and try gain. Don’t stress yourself to hard. Well now, Tiana, aren’t you just the smartest thing ever!!! It worked!!!! I don’t know how you knew to do this, but I am so glad. Thank you!! I only have gmail and I just checked VPN and it says No VPN’s. Any other possible causes? Thank you. I cant seem to figure it out either its so frustrating, any luck? Hey hun I figured it out go to settings, security, and clear credentials. Once complete you can go and remove or turn off you finger print scanner. Tiana, my thaks to you as well. i hated that fingerprint lock that got forced on me due to a utilities program. With your help I was able to trash it!! It should ask you to swipe your finger before asking for backup password. You can try to reboot the phone and try again. Not sure what that is exactly, but what can I do to find out if I have done this and how to reverse it? Very appreciative of your help. If you have either VPN or Exchange (email) account, you cannot choose swipe. You need remove them before swipe is available. Did you set up any email accounts in email app (not gmail)? VPN can be found in Settings–More networks–VPN. I want to turn off my finger scanner but my Note 4 will not let me. I went to Lock Screen, then under Screen Lock it says ‘secured by fingerprints’. I hit that and it prompts me to scan my fingerprint. When I do this, it goes to the list of security options. The options Swipe and None are not allowing me to select them, they are grayed out and both say turned off by administrator. The others (pin, partern, etc) will allow me to select them. What do i do to get this finger scanner turned off? I don’t like it. Very likely, you added some exchange accounts or vpns. They will not allow you to turn off the security on lock screen. I was trying to figure out how to sign in to websites using the fingerprint scanner? You have to use Internet browser, not Chrome. Only a few sites are supported. just will not work have set it up many times but have to go back to pin. It’s most annoying. When registering your fingerprints, you should try several different locations of your fingerprints. Everytime i go to press the fingerprint scanner button it says that theres an error and that i have to restart my phone. But even when i already restarted the phone like 20 times it still says the same thing. What am i doing wrong!? In that case, you can unlock the phone with the backup password. Disable fingerprint for lock screen. Restart the phone, set the lock screen to fingerprint scanner, then try to lock and unlock with fingerprints. Hi, the other input is swype . I checked the android device manager is activated. Can you tell me how I use it on my PC? On your pc, just Google Android device manager and follow the link. After logging in, you can locate the phone, ring your phone or unlock the screen. I have been using my finger print scanner on my note 4. But sometimes it does not recognize my prints.Then I have to wait the 30 seconds and hope it works the next time. My big problem is that if my prints are not recognized I try to select enter backup password. All I get is a pop up saying choose input method. I choose samsung keyboard. I am then caught in a loop, I do not get a keyboard to enter my password. probably, you have installed other input method or keyboard. You need set one as default so that it will ask you to choose. I do have the samsung selected as default. As to using different fingers. Are you saying as it asks for the 10 different swipes I can swipe say my thumb 4 times ,my 1st finger 3 times and my 3rd finger 3 time’s? Then I would be able to unlock trying the three different fingers? I am still scared about not being able to get the chance to enter my password. I might get locked out of my phone then what do i do? For the input method, what’s the other input app? For registering fingerprints, yes, you can use different fingers for one fingerprint. If you cannot unlock the phone, you can use Android device manager on your PC to unlock the phone. By default, it is on. You can check it in Settings–Security–Device Administrators. Anyway, if you have no confidence on finger scanner, you should use other screen security settings (e.g., PIN or password). Can you enter fingerprint manager? I have registered my finger print but unable to make the screen lock secured with the Fingerprint scan. In fact, when I tried to select the screenlock, The Fingerprint section is greyed out with a message that says “Turned off by administrator, encryption policy or credential storage.” How do I make my screen lock secured with my Fingerprint instead of PIN. Thank you very much for your help. You probably have an exchange account in your phone. Yes. you are right, Simon. Is there a way to get around? This Exchange account is forcing me to use 6 digit PIN instead of 4 and that is really drive me nut sometimes. Thanks. There is no workaround as i know. Micosoft programs always require excessive permissions. Exchange is the worst. It may control your phone remotely, erase all data in the phone. Unless the phone is given by your company, you should stay away from exchange account. You can add the account as normal email account. Of course, you will lose the exchange calendar and directory. Anyway, it’s up to you and who owns the phone. If you just use the email feature, add it as a normal email account. If the phone is configured by the IT staff, you cannot do anything. You can unlock the phone with Android device manager from a PC with your Google account. Please Google Android device manager. Then follow the link. By default, ADM is on in all Android phones. Android device manager does not unlock phones now. it can only lock phones (imagining you lost your phone and you don’t have a security lock for the screen). In some (NOT all) regions, if you offer wrong backup password a few times, it allows you to unlock with a Google account. If unlock via Google account option does not s appear, you can try to clear cache partition, then reboot normally. it may allow you to use fingerprint again. You can also try luck with safe mode. Reboot your phone into safe mode, if it may allow you to use fingerprint to unlock the phone. If not, just reboot again. What if I want to temporarily want to not use the fingerprint scanner to unlock my phone. Can I turn it off without having to reinstate my fingerprints and pass word?? Yes, you can change the lock screen settings to others in Settings–Lock screen (under device category)–Screen lock. I tried the Fingerprint lock and it is a bit of a pain for me. I want to go back to the “swipe to unlock phone” feature that has no authentication required. How do i do that? in Settings–Lock screen –Screen lock, you set set it back to swipe. Very likely, you added exchange account or vpn accounts. Both require some security settings on the lock screen. I have a AT&T Note 4, I tried to use the fingerprint scanner to unlock my phone after I registered my fingerprint and backup a password. The fingerprint scanner didn’t recognize my thumb print after the phone is turned off, and I have to use the backup password to access my phone, how can I reset this finger scanner if it don’t recognize my print? Please help! 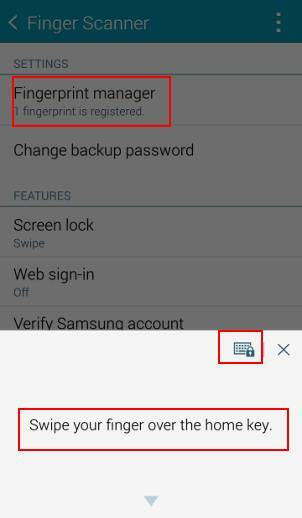 You can de-register your fingerprints (with your backup password) as shown in “How to manager fingerprints in Galaxy Note 4 finger scanner” part of this guide. 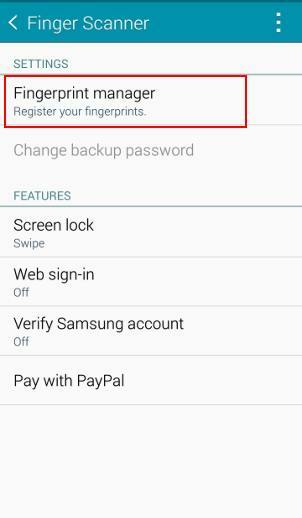 In Settings –Finger scanner–Fingerprint manager. You can authenticate yourself with the backup password. Then you can see the list of registered fingerprints. Tap and hold any of them to select it. You can select more. Then tap the delete (dustbin) icon in top right to de-register (remove the fingerprints). You can always register fingerprints again. Ok, My wife has a note 4 and started using her finger scanner. Everything was going great. Then tonight, she went to scan her finger to unlock her phone and it would not recognize her finger. So she entered her backup password. That allowed her to access the phone. I advised her to go delete her finger scans and re-scan them. So she accessed the Finger Scanner menu under settings and had to put in her backup password, the phone keeps saying that the backup password is incorrect. How is this the case when it was the correct backup password for her to access the phone? PLEASE HELP!!! Yes, it should be the backup password. Anyway, if you can still unlock the phone with the backup password, you should set screen lock to something else. What if I want to delete my registered fingerprint? I have gone to fingerprint manager and it won’t let me delete it after I select it! What do I do, I hate this thing….please help! Any errors when you try to delete it? i want to deactivate the password feature every time at the lock screen. i was able to get rid of the finger scan but now it asks for a password each time. all my options are greyed out. i’ve tried the clear credentials and nothing. my phone is encrypted does that have something to do with it? can you have the finger scan for websites only and not the lock screen? If the phones is encrypted, you must set a password for the lock screen. It doesn’t make sense to encrypt the phone with unlocked screen. Remove the encryption if you need set lock screen security as none or swipe.